This funded training activity uses a State based variation of the AVETMISS standard to report and reconcile data for payment to training providers. It is important to ensure you set up your onCourse records correctly to export your data in the correct format to receive prompt payment for your training delivery. The Smart and Skilled contracts require you to lodge your compliant training files (NAT Files) every 28 days. This is known as progressive or ongoing reporting. This type of reporting is designed capture progression information about a student i.e. commencement, progression, and eventually, their complete qualification or skills group. Commencement - the enrolment is reported with a commitment ID and at least one outcome reported as 70 - Continuing Enrolment. Progression - one or more claims paid when the enrolment is reported with required milestones (i.e. started and completed outcomes). Please refer to Smart & Skilled Operating Guidelines for details, different qualifications have different progression milestone and payment amounts. NOTE: The milestones include those who withdrew after they started their training, and you may be able to claim progression payments when the student withdraws. 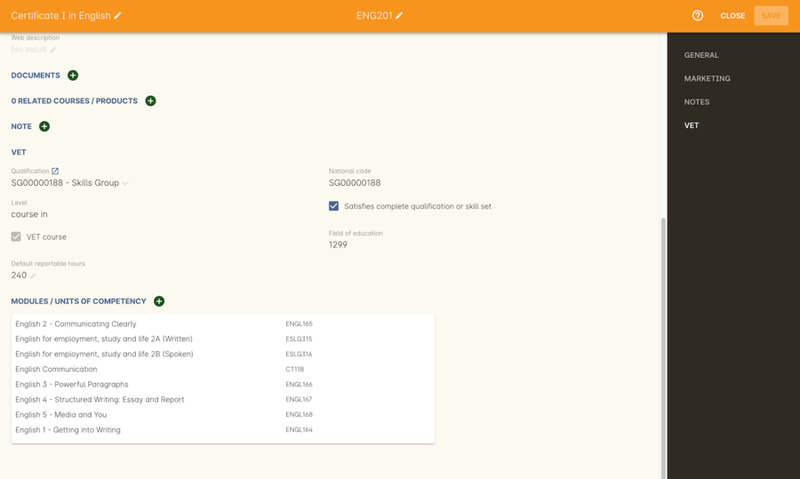 Completion - the enrolment reported with a final status for all outcomes and a complete record in the NAT00130 file. Completion payments are only paid if the student has been issued with the qualification, and not if the student is withdrawn. You are expected to report all the outcomes in the qualification with each batch of NAT Files, including outcomes that are not yet started or did not start. e.g. for a Diploma of Business with eight units of competency, initial lodgement of data will have one outcome as 70 - Continuing Enrolment, and seven outcomes as 85 - Not Yet Started. As the student progresses through the training, their outcomes statuses are updated. Claims will be paid based on their level of progression. e.g. for a Diploma of Business with eight units of competency,the progression claim is paid after move the 4 outcomes are reported as 70 - Continuing Enrolment and at least one outcome is reported as 20 - Competent. Smart & Skilled reporting does not rely on calendar year. If you don't report completion or withdrawal data, the student will remain active. The National AVETMISS reporting specification was originally designed to report training completion after the fact i.e. at the end of the calender year, and shoehorning this standard into a continual reporting framework takes continual effort on the part of STS and software vendors like ish to find new and creative ways to report your data in a way that requires the least amount of effort on your part. onCourse contains a number of features and functions to smooth your reporting journey. Many can be set up to help you manage the often complex requirements for Smart & Skilled reporting. Ideally, you will create courses for Smart and Skilled enrolments that contain all the outcomes for the qualification or skill set in the course level. This will then mean you have only one enrolment to report for each student, and that single enrolment will contain all the outcomes for the student's funded course. Some providers will choose to make multiple courses for reporting their Smart and Skilled students for operational reasons. In those instances, the Commitment ID and Funding Source will need to be added to every enrolment that contains outcomes for the student. These enrolments may represent clusters of outcomes, or single outcomes. The instructions given in this documentation assume that one enrolment per student is the norm, but you can adapt these instructions as needed to your environment. Skills Group are special 'made up' Skill Sets or mini qualifications that have been invented by STS to allow funding for clusters of units under the Smart and Skilled funding program. onCourse includes by default all official training package and accredited course qualifications from Training.gov.au, but not the Skills Groups. The Skills Groups codes are created by STSOnline on an ad hoc basis, they need to be manually entered in the onCourse qualification database as you receive the funding contact and before you try to report the student. It is important you do this as early as possible in the process as so not to hold up your reporting. Make sure you tick the option 'Satisfies complete qualification of skill set' to ensure the data is correctly reported for these students as an enrolment in a mini qual, rather than a standalone set of units. IMPORTANT: If you don't have the Skills Group added to onCourse when you set up the course, you can still set up the course and enrol the student. The Skills Group code and tick box can be added later, after enrolment if needed. All this information affects is AVETMISS reporting and Certification defaults. Data collection rules and forms allow you to define what information is collected during the online enrolment, application and waiting list process. Before you set up your Smart and Skilled courses you may want to consider if there is a need to set up a special set of forms and rules for your Smart & Skilled program. To streamline the reporting process, ensure you have enabled the Smart and Skilled funding contract. Smart and Skilled is a default funding contact in onCourse. Instructions on activating the default contacts are in the section called “ Funding Contracts and AVETMISS exporting”. You can also add additional funding contracts if you want to split your Smart and Skilled reporting into smaller subgroups, managed by different parts of the business. There are a few setting you will need to use if you want to take advantage of the full range of Smart and Skilled features in onCourse. These features will assist you in collecting the data required and reporting it in a timely manner. It is expected that you are already familiar with the standard course and class set up process before you read this documentation about the specific Smart and Skilled set up requirements. Every course in onCourse can be either 'Enrolment by Application' or 'Open Enrolment'. This enrolment type determines how students can interact with the course on the web. A course that is open enrolment allows students to enrol and pay directly. A course that is Enrolment by Application allows for a second level of checks, for example, to check a student meets the funding requirements, prior to proceeding to enrolment. To enable online Eligibility Checks and applications for Commitment IDs for Smart and Skilled courses, you will need a course for Smart and Skilled that is set up as visible online and enrolment by application. If you have Fee for Service and Smart and Skilled enrolments in the same class, you may decide to complete the eligibility check for each applicant. This means you will set up the same course for the qualification or skills set, and have all prospective students apply for a Smart and Skilled Quote. If your classes are primarily Smart and Skilled enrolments this is the best option. Some providers will have a range of Fee for Service and Smart and Skilled enrolment in the class. If you are providing both you may decide to have two courses set up, one for Smart and Skilled that is by application, and one for your Fee for Service class that is 'open enrolment'. If you do have two courses, you will need to consider your strategy with classes, and whether you will have lots of classes available. This is generally more complex than taking all students by application and providing them with a Quote, and we suggest you contact our support team to talk through the options before you proceed with this set up. Most providers with Smart and Skilled funding for a qualification or skills set have the course set up by application to give the student the option to take up the Smart and Skilled funding if it's available to them. This will allow students to make the decision to take up the Smart and Skilled funding after they have received the details of the Quote. If the student is does not wish to accept the Smart and Skilled Quote, and you can enrolment them as a Fee for Service using the same application process as the Smart and Skilled enrolments. All Smart and Skilled courses need at least one class to enrol students into. If you expect the majority of enrolments to be under Smart and Skilled Funding, you can make STSOnline (NSW) the default funding contact at the class. All new enrolments in the class will adopt this default. If you expect a fairly equal mix of fee for service students and Smart and Skilled funded students, you can make the funding contract 'Fee for service (non funded)' and set the funding source for the Smart and Skilled students at the enrolment level instead. After processing the student enrolment in Quick Enrol, open the enrolment record to add additional Smart and Skilled data. The field Purchasing Contract Identifier has also been added to the enrolment general tab to store the Commitment ID for Smart & Skilled enrolments. All outcomes in an enrolment will be reported with this Commitment ID. An email address is mandatory for all Smart & Skilled students. If the student does not have an email address, or has chosen not to provide one, onCourse will export notprovided@example.com. If later down the track the student withdraws or defers their enrolment, the TNC code can also be entered in this window. STSOnline requires you to successfully submit a Smart and Skilled lodgement every 28 days. You do not have report all students data every 28 days, only new data or changes. STSOnline expects new activity to be lodged within 28 days the activity date i.e. if a student starts a new unit of competency that should be reporting within 28 days of the start date. Smart and Skilled claims are paid 6 weeks or 42 days of the successful lodgement of the data, so it's within your RTO's best interests to do smaller, more frequent lodgements than to wait for a once a month process. Lodging every 14 days is ideal. Smart and Skilled enrolments can be reported as individuals, groups, classes, etc. You are not required to report a full batch of data for each upload. Smart and Skilled reporting is progressive rather than by calendar year. If a student completes and has their final data approved they are not expected to be reported again in that year. If a student's enrolment is ongoing then you are expected to report any new activity. STSOnline limits you to three uploads a day, so if you need to correct an error, you may need to wait until the next day to do another upload. If your data set includes a Skills Group code as discussed earlier in this chapter, a NAT00030A file will be generated, instead of a NAT00030 file. onCourse makes this choice automatically depending on the data set you are exporting. This is a new requirement under AVETMISS 8. If you do not export a NAT00030A file where expected, you may have neglected to check the 'satisfies complete qualification or skill set option' in your Smart and Skilled skills group course. Smart and Skilled enrolment has specific reporting requirements for cancellations or deferrals which are outline below. For more information please refer to the "Smart and Skilled eReporting Technical Specifications and Business Validations" available to providers on the STSonline provider portal. Student in the Smart & Skilled Program have the ability to defer their training for up to 12 months. More information on the obligations of your RTO for deferrals are outlined in the Smart and Skilled Operating Guidelines under Deferring Students. To report the Deferred enrolment, you will need to change the outcome start and end dates to the expected training dates in the future. In the 'Outcome identifier - Training Organisation' field you will need to record Training Deferred (D) value for the enrolment. Change the start and end dates of the outcomes to match the new study dates for the student e.g. if the student is deferring to 30/03/2019, their new outcomes start and end dates might be 30/03/2019 - 15/04/2019. Go to the Enrolment, and on the General Tab, add D in the field Outcome Identifier - Training Organisation. The Student will continue to be lodged in the NAT File with future dates and D for deferral during your regular lodgement. Once the Deferral dates have passed, you will get errors from the combination of D and current outcome dates. Cancellations under Smart and Skilled have a few rules that a quire unique. This is because they report all outcomes under the qualifications, and use continuing lodgement to collect progression details on outcomes not yet started. This means that if the student does not complete their training, you need to notify STSOnline of the status of all the outcomes in the student's qualification. 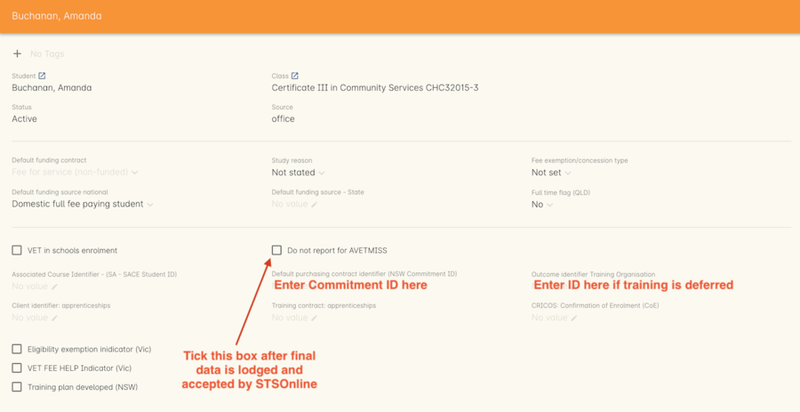 STSOnline will consider all student continuing students until you report final data for all outcomes. You must to do this for cancellations student to finalise your eReporting requirements, and to ensure that you receive any claims available under the progression claims. Any 40 - Withdrawn outcome is considered a 'final' outcome for the purpose of the progression claims, and could trigger a claim of up to 40% of the total funding amount. If the student did not engage in any training, you will need to set their outcomes status to Did Not Start (NSW:66, SA:@@) in onCourse. NOTE: STSOnline (NSW) flavour exports will export outcomes set as Did not Start as 85 - Not Yet Started as per STSonline's requirements. To report final data for the enrolment, the 85 - Not Yet Stated much be combined with the TNC. If you have not added TNC then you will get an error when you try to lodge the final data. Once the Student's final outcome data is lodged and accepted by STSOnline, you no longer need to report their data. To suppress the data from future lodgements, check the option 'Do not report for AVETMISS' on general tab of the enrolment. Any outcomes 'Not Set' in the need to be changed to Withdrawn - 40 if the student started training, or Did Not Start (NSW:66, SA:@@) if the student didn't start training. If the student already has a final outcome (RPL, Competency, Credit Transfer etc) leave the status as is. Go to the Enrolment, and on the General Tab, add TNC in the field Outcome Identifier - Training Organisation. Lodge the Student data and correct any errors. Once the cancelled student data is lodged successfully, go to their Enrolment, and on the General Tab, tick the box 'Do not Report for AVETMISS'. onCourse has developed processes that allow you to collect the student's information and lodge it with State Training Services using the STSOnline provider portal. You will need to ensure the following set up at the course level before you can proceed. You will need to ensure you have collected express consent for the student's data to be used in the provider calculator. To do this, you will need to update your terms and conditions page on the website to include the consent to use the data collected in application or enrolment to determine the student's eligibility where the application is for a Smart and Skilled program. Details of the requirement for prospective students' consent are under Section 6 the "Smart and Skilled Operating Guidelines", with draft wording provided in Schedule 1 of the same document. The "Smart and Skilled Operating Guidelines" are available to providers on the STSonline provider portal. More information on how to edit your terms and conditions on your website is located in our ??? Go to top menu, select Activity and then select Applications. This will open the application list view. From the Applications list view, sort and filter the list until you have the application you want in the batch. Go to the Export icon on the top right hand of the list view and select the export file "Smart and Skilled Bulk Upload" and click export. The bulk upload template will need to be edited before you can upload it via the STSOnline provider portal. Certain fields are mandatory and must be completed for a successful upload. Some fields are conditional and only need to be completed if another field has a value. A few fields are optional and do not need to be completed for he Eligibility checks. Full details of the fields and their specifications are found in the "Smart and Skilled Provider Calculator Data Specifications and User Guide Multiple Student Process" available from the STSOnline provider portal. onCourse has added values where applicable from the student, employer, course or class and included some default values for fields as details below, however, the provider will need to confirm that they are accurate and correct for each upload. All values in the export will need to be reviewed and verified by the operators to ensure it's compliant. You should consult the documentation on the STSOnline provider portal for specific information. We recommend you download the "Smart and Skilled Provider Calculator Data Specifications and User Guide Multiple Student Process" Table 1 Bulk Upload file and confirm the values you will need to enter with your compliance team or management before you do your first upload. Please make sure to check that the dates are formatted as DD/MM/YYY for all date columns, some spreadsheet programs will change the date formats when the file is opened. You can use the same Bulk Upload template to upload your commitment IDs, however, some of the mandatory and compulsory fields will change. Certain fields are mandatory and must be completed for a successful upload. Some fields are conditional and only need to be completed is anther field has a certain value. A few fields are optional and do not need to be completed for he Eligibility checks. Full details of the fields and their specifications are found in the "Smart and Skilled Provider Calculator Data Specifications and User Guide Multiple Student Process" available from the STSOnline. onCourse has provided the unique student values, course or class values and some defaults to the most commonly used values included, however, the college will need to confirm that they are accurate and correct for each upload. We recommend you download the "Smart and Skilled Provider Calculator Data Specifications and User Guide Multiple Student Process" Table 1. Bulk Upload file and confirm the values you will need to enter with your compliance manager before you do your first upload. Full details of the Upload process, including screen shots and additional information is available in the "Smart and Skilled Provider Calculator Data Specifications and User Guide Multiple Student Process" available from the STSOnline provider portal. A brief summary is available below, however, it may be amended at any time by State Training Services. Click the blue Login button under STS Online. From the homepage, click on the button 'RTO Contract Services'. This will take you to the Welcome to "Contract Services" page. Go to the Smart and Skilled Provider Calculator menu on the left of the screen and click on "Smart and Skilled Provider Calculator". The Provider Calculator homepage will be displayed. Click on the "Student enrolment notification" option on the provider calculator page. This will take you to a new page. Click on the "Enquiry and Notification – bulk upload" option. You will need to confirm you have express consent, click next. Click the "Browse" button located at the bottom of the screen. This will open a file search of your computer. Locate the Bulk Upload file and click "Open" then "Upload". A pop up menu will appear. Click OK. When the processing of the file is complete, the user who uploaded the file will receive an email advising whether the upload was successful or unsuccessful. If the upload is unsuccessful, a reason will be provided in the email.